Soldiers seem to be everywhere. To live in Constantinople is like living in some vast camp. When I was there, Tur­key was preparing feverishly for war. The streets were blocked with trains of artillery. The steamers in the harbor were vomiting forth regiments of infan­try. Patrols of horsemen paraded the city. On my first night in Pera, when, weary with my efforts to obtain some gen­eral conception of what the spectacular monster really was, what it wanted, what it meant, what it was about to do, I had at length fallen asleep toward dawn, I was wakened by a prolonged, clattering roar beneath my windows. I got up, opened the shutters, and looked out. And below me, in the semi-darkness, I saw interminable lines of soldiers passing: offi­cers on horseback, men tramping with knapsacks on their backs and rifles over their shoulders; then artillery, gun-car­riages, with soldiers sitting loosely on them holding one another's hands; guns, horses, more horses, with officers riding them; then trains of loaded mules. On and on they went, and always more were coming behind. 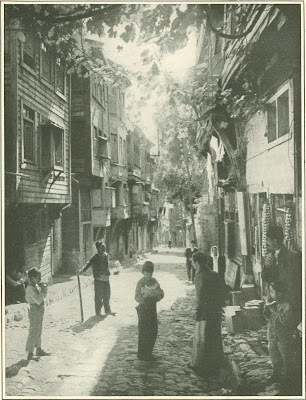 I watched them till I was tired, descending to the darkness of Galata, to the blackness of old Stamboul. Gradually, as the days passed by, I be­gan to understand something of the city, to realize never what it wanted or what it really meant, but something of what it was. It seemed to me then like a person with two natures uneasily housed in one perturbed body. These two natures were startlingly different. One was to me hate­ful—Pera, with Galata touching it. The other was not to be understood by me, but it held me with an indifferent grasp, and from it there flowed a strange and almost rustic melancholy that I cared for—Stam­boul. And between these two natures a gulf was fixed—the gulf of the Golden Horn. Pera is a mongrel city, set on a height and streaming blatantly to Galata; a city of discolored houses not unlike the houses of Naples; of embassies and churches; of glaring shops and cafes glittering with plate-glass, through which crafty, impudent eyes are forever staring; of noisy, unat­tractive hotels and wizen gardens, where bands play at stated hours, and pre­tentious, painted women from second-rate European music-halls posture and squall under the electric lamps. There is no rest, no peace in Pera. There seems to be no discipline. Motor-cars make noises there even in the dead of night, and when standing still, such as I never before heard or imagined. They have a special breed of cars in Pera. Bicyclists are allowed to use motor sirens to clear the way before them. One Sunday when, owing to a merciful strike of the coachmen, there was comparative calm, I saw a boy on horse­back going at full gallop over the pave­ment of the Grande Rue. He passed and re-passed me five times, lashing his horse till it was all in a lather. Nobody stopped him. You may do anything it seems, in Pera, if it is noisy, brutal, objectionable. Pera has all that is odious of the Levant: impudence, ostentation, slyness, indeli­cacy, uproar, a glittering commonness. It is like a blazing ring of imitation dia­monds squeezing a fat and dirty finger. But it is wonderfully interesting simply because of the variety of human types one sees there. The strange thing is that this multitude of types from all over the East and from all the nations of Europe is re­duced, as it were, by Pera to a common, a very common, denominator. The influ­ence of place seems fatal there. Stamboul is a city of wood and of mar­ble, of dusty, frail houses that look as if they had been run up in a night and might tumble to pieces at any moment, and of magnificent mosques, centuries old, solid, huge, superb, great monuments of the sul­tans. The fire-tower of Galata looks to­ward the fire-tower of Stamboul across a forest of mast; but no watchfulness, no swiftness of action, can prevent flames from continually sweeping through Stam­boul, leaving waste places behind them, a wonderful garden city, warm, almost ruddy, full of autumnal beauty, with its red-brown roofs and its trees. And out of its rich-toned rusticity the mosques heave themselves up like leviathans that have nothing in common with it; the Mosque of Santa Sophia, of the Sultan Achmet, with its six exquisite minarets, of Moham­med the Conqueror, of Suleiman the Mag­nificent, and how many others! There is no harmony between the mosques of Stamboul and the houses of Stamboul. The former are enduring and grand; the latter, almost like houses of cards. And yet Stamboul is harmonious, is very beautiful. Romance seems brood­ing over it, trailing lights and shadows to but dying at the feet of the mosques. As one looks, at Stamboul from the heights of Pera, it rises on its hills across the water, beyond the sea of the Golden Horn, like cloth it with flame and with darkness. It holds you, it entices you. It sheds upon you a sense of mystery. What it has seen, Stamboul! What it has known! What a core of red violence that heart has and always has had! - When the sunset dies away among the autumnal houses and between the minarets that rise above the city like prayers; when the many cypresses that echo the minarets in notes of dark green become black, and the thousands of houses seem to be subtly run together into a huge streak of umber above the lights at the waterside; when Seraglio Point stretches like a shadowy spear toward the Bosporus and the Black Sea, and the coasts of Asia fade away in the night, old Stam­boul murmurs to you with a voice that seems to hold all secrets, to call you away from the world of Pera to the world of Aladdin's lamp. Pera glitters in the night and cries out to heaven. Old Stamboul wraps itself in a black veil and withdraws where you may not follow. When I think of Constantinople as a whole, as seen, say, from the top of the Galata tower, set up by the Genoese, I think of it as the most wonderful, the most beautiful, and the most superbly situ­ated city I ever have seen. It is an Eastern city of the sea, pierced by water at its heart, giving itself to the winds from Marmora, from the Golden Horn, from the Bosporus, from the Black Sea. The snows of Asia look upon it across the blue waters of Marmora, where the Iles des Princes sleep in a flickering haze of gold. 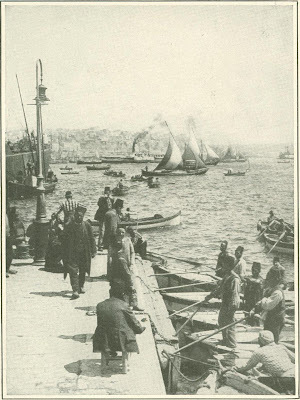 Stamboul climbs, like Rome, to the summits of seven hills, and gazes over the great harbor, crowded with a forest of masts, echoing with sounds of the sea, to Galata, and to Pera once height. And the Golden Horn narrows to the sweet waters of Europe, but broad­ens toward Seraglio Point into the Bos­porus, that glorious highway of water be­tween Europe and Asia, lined with the palaces and the villas of sultans and pashas, of Eastern potentates and of the Euro­pean Powers: Yildiz, and Dolma bagt­che, Beylerbey, and Cheragan, the great palace of the Khedive of Egypt's mother, with its quay upon the water, facing the villa of her son, which stands on the Asian shore, lifted high amid its woods, the pal­ace of the "sweet waters of Asia," the gigantic red-roofed palace where Ismail died in exile. Farther on toward The­rapia, where stand the summer embassies of the Powers, Robert College, dignified, looking from afar almost like a great gray castle; rises on its height above its sloping gardens. Gaze from any summit upon Constantinople, and you are amazed by the wonder of it, by the wonder of its set­ting. There is a vastness, a glory of men, of ships, of seas, of mountains, in this grand view which sets it apart from all other views of the world. Two seas send it their message. Two continents give of their beauty to make it beautiful. Two religions have striven to sanctify it with glorious buildings. In the midst of its hidden squalor and crime rises what many consider the most beautiful church—now a mosque—in the world. Perhaps no harbor in Europe can compare with its harbor. For human and historical interest it can scarcely be equaled. In the shadow of its marvelous walls, guarded by innumerable towers and girdled by forests of cypresses, it lies like some great ma­gician, glittering, mysterious, crafty, pray­ing, singing, intriguing, assassinating, looking to East and West, watchful, and full of fanaticism. I crossed the new bridge. 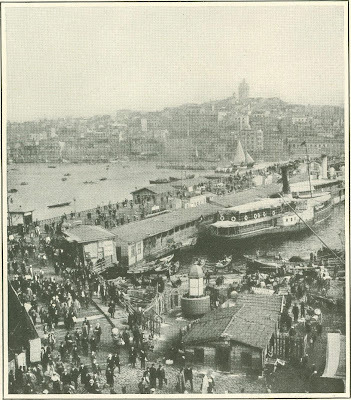 The famous old timber bridge, which rocks under your feet, has been moved up the Golden Horn, and now spans the sea by the marine bar­racks. Evening was falling; a wind had brought clouds from the Black Sea. The waters were colorless, and were licked into fretful wavelets, on which the deli­cate-pointed caiques swayed likes leaves on a tide. Opposite to me, at the edge of Stamboul, the huge Mosque of Yeni-Valide-Jamissi rose, with its crowd of cu­polas large and small and its prodigious minarets. 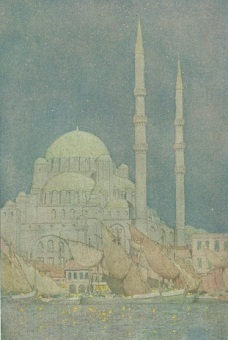 Although built by two women, it looked stern and male, seemed to be guarding the bridge, to be proclaiming to all the mongrels from Galata and Pera, who hurried from shore to shore, that Stamboul will make no compromise with the infidel, that in the great space before this mosque the true East in Europe begins. Russia was in the wind, I thought. The breath of the steppes was wandering afar to seek—what? The breath of the desert? The "great mosque confronted it, Islam erect, and now dark, forbidding under the darkening sky. Even the minarets had lost their delicate purity, had become fierce, prayers calling down destruction on unbelievers. And all the cries of Stam­boul seemed to gather themselves together in my ears, keening over the sea above which I stood—voices of many nations; of Turks, Arabs, Circassians, Persians, of men from the wilds of Asia and the plains of India; voices of bashi-bazouks and of slaves; even, thin high voices of eunuchs. From the quays to right and left of the bridge crowds of people rose to my sight and hurried away; to them crowds of peo­ple descended, sinking out of my sight. Soldiers and hamals passed, upright and armed, bending beneath the weight of in­credible loads. Calls of Albanian boat­men came up from the sea. From the city of closely packed fishermen's vessels rose here and there little trails of smoke. On their decks dim figures crouched about wavering fires. A gnarled beggar pushed me, muttering, then whining uncouth words. Along the curving shore, toward the cypress-crowned height of Eyub, lights were strung out, marking the waterside. Behind me tall Pera began to glitter mere­triciously. The Greek barbers, I knew, were standing impudently before the doors of their little saloons, watching the eve­ning pageant as it surged slowly through the Grande Rue and toward the Taxim Garden. Diplomats were driving home from the Sublime Porte in victorias. The "cinemas" were gathering in their mobs. Tokatlian's was thronged with Levantines whispering from mouth to mouth the current lies of the day. 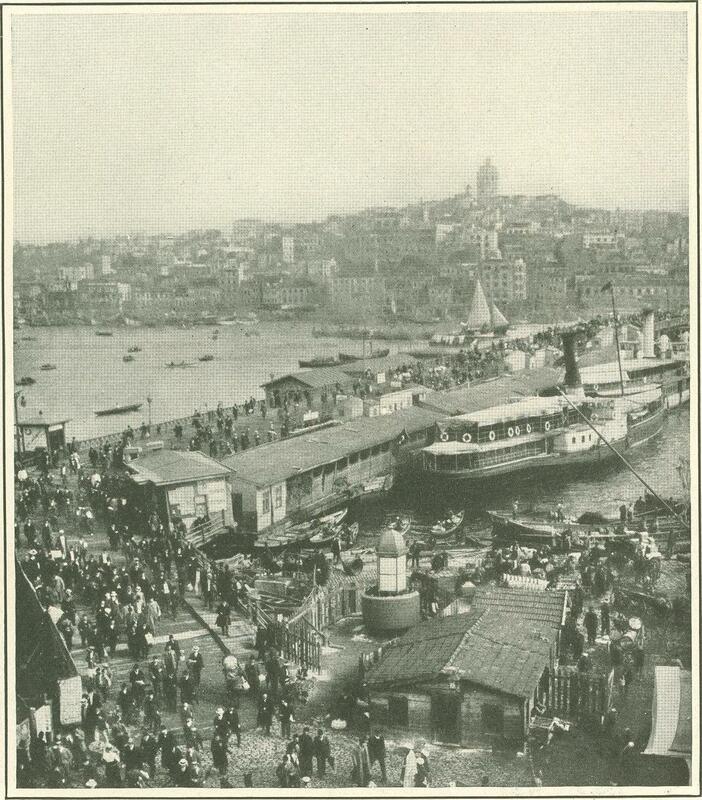 Below, near the ships, the business men of Galata were rushing out of their banks, past the large round-browed Montenegrins who stand on the steps, out of their offices and shops, like a mighty swarm of disturbed bees. The long shriek of a siren from a steamer near Seraglio Point tore the gloom. I went on, despite menacing Valide Sultan, I lost myself in the wonderful maze of Stamboul. Stamboul near the waterside is full of contrasts so sharp, so strange that they bewilder and charm, and sometimes render uneasy even one who has wandered alone through many towns of the East. Sordid and filthy, there is yet something grandiose in it, something hostile and threatening in the watchful crowds that are forever pass­ing by. Between the houses the sea-wind blows up, and you catch glimpses of wa­ter of masts, of the funnels of steamers. Above the cries of the nation’s rise the long-drawn wails and the hootings of sirens. The traffic of the streets is made more confusing by your constant consciousness of the traffic of the sea, em­braced by it, almost mingling with it. Water and wind, mud and dust, cries of coachmen and seamen, of motor-cars and steamers, and soldiers, soldiers, soldiers passing, always passing. Through a win­dow-pane you catch a glitter of jewels and a glitter of Armenian eyes gazing stealth­ily out. You pass by some marble tombs sheltered by weary trees, under the giant shadow of a mosque, and a few steps far­ther on you look through an arched door­way and see on the marble floor of a dimly lighted hall half-naked men, with tufts of black hair drooping from partly shaved heads and striped towels girt round their loins, going softly to and fro, or bending about a fountain from which water gushes with a silvery noise. This is a Turkish bath. Throughout Stamboul there are bath-houses with little cupolas on their roofs, and throughout Stamboul there are tombs; but the uneasy and watchful crowds throng the quarters near the waterside and the great bazaars and the spaces before the principal mosques. They are not spread through­out the city. Many parts of Stamboul are as the waste places of the earth, abandoned by men. By night they are silent and black; by day they look like the ways of a great wooden village from which the inhabitants have fled. In their open spaces patches of waste ground, perhaps a few goats are try­ing to browse among rubbish and stones, a few little children are loitering, two or three silent men may be sitting under a vine by a led, which is a Turkish cafe. There is no sound of steps or of voices. One has no feeling of being in a great city, of being in a city at all. Little there is of romance, little of that mysterious and exquisite melancholy which imagina­tive writers have described. Dullness and shabbiness brood over everything. Yet an enormous population lives in the appar­ently empty houses. Women are watch­ing from the windows behind the grilles. Life is fermenting in the midst of the dust, the discomfort, the almost ghastly silence. The great bazaar of Stamhbul is a city within a city. As you stand before its entrance you think of a fortress full of im­mured treasures. And there are treasures of price under the heavy arches, in the long roofed-over lanes. The bazaars of Tunis seem minute, of Damascus ephemeral, of Cairo dressed up, of Jerusalem crushed together and stifling, when' com­pared with the vast bazaars of Stamboul, which have a solidity, a massiveness, un­shared by their rivals. I saw there many cheap goods such as I have seen on certain booths in the East End of London, but they were surrounded with a certain pomp and dignity, with a curious atmosphere of age. Some parts of the bazaars are nar­row. Others are broad and huge, with great cupolas above them, and, far up, wood­en galleries running round them. Now and then you come upon an old fountain of stained marble and dim faience about which men are squat­ting on their haunches to wash their faces and hands and their carefully bared arms. The lanes are paved and are often slippery. Just under the lofty roof there are win­dows of white glass, and about them, and on arches and walls, there are crude deco­rations in strong blues and purples, yellows and greens. 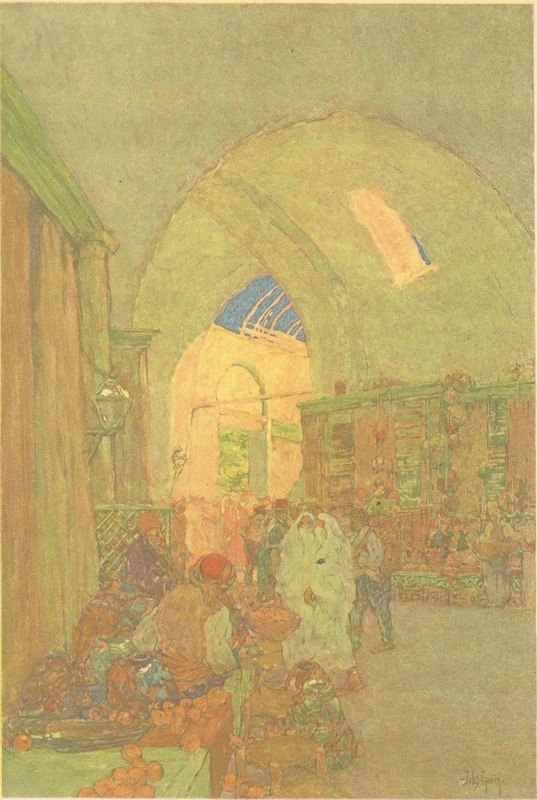 The seri­ous merchants from many lands do not be­set you with importunities as you pass; but sometimes a lus­trous pair of eyes invites you to pause, or a dark and long-fingered hand gently beck­ons you toward a jewel, a prayer-carpet, a weapon, or something strange in silver or gold or ivory. One day a man from Bagdad invited me to buy a picture as I drew near to him. It was the portrait of a dervish's cap worked in silk. The cap, orange-colored and silver, was perched upon a small table (in the picture) above which hung cur­tains in two shades of green. A heavy gilt frame surrounded this "old master" of the East. We bargained. The mer­chant's languages were broken, but at length I understood him to say that the cap was a perfect likeness. I retorted that all the dervishes' caps I had seen upon liv­ing heads were the color of earth. The merchant, I believe, pitied my ignorance. His eyes, hands, arms, and even his shoulders were eloquent of compassion. 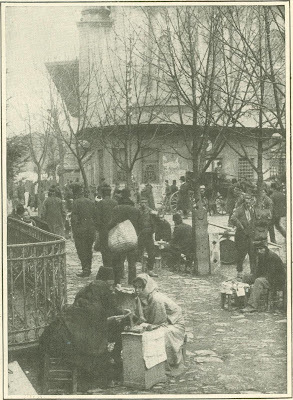 He lowered the price of the picture by about half a farthing in Turkish money, but I resisted the blandishment and es­caped into the jewel bazaar, half regret­ting a lost opportunity. 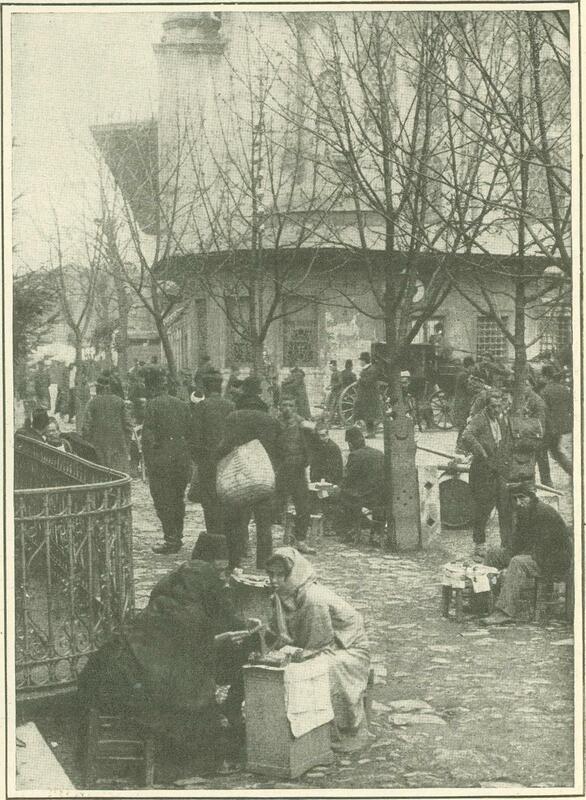 Many Turkish women come to the bazaars only to meet their lovers. They cover a secret desire by a pretense of mak­ing purchases. From the upper floor of the yellow-blue-and-red kiosk, in which Turkish sweets are sold, and you can eat the breasts of chickens cooked deliciously in cream and served with milk and starch, I have watched these subtle truants pass­ing in their pretty disguises suggestive of a masked ball. They look delicate and graceful in their thin and shining robes, like dominoes, of black or sometimes of prune-color, with crape dropping over their faces and letting you see not enough; for many Turkish women are pretty. "Yes, you are right. It is foolish ever to conceal such a face as this with a veil when really there is not too much beauty in the world. Mais que voulez-vous? Les Turcs!" And the little hanum surely moved her thin shoulders con­temptuously. But her elderly companion pulled at her robe, and slowly she moved away. As the two women left the room, the photographer, a Greek, looked after them, smiling. Then he turned to me, spread out his thin hands, and said, with a shrug, "Encore des desenchantees!" "That house has been abandoned for years. Everyone has migrated long ago from this quarter of Stamboul. If you stay here, you will be quite alone." But the old Turk knew very well that all the houses were full of people, of imprisoned women. What a fate to be one of the prisoners! 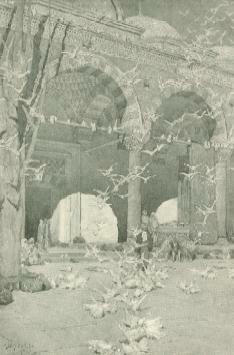 That was my thought as I looked at the sacred pigeons, circling in happy freedom over the garden where Bajazet slumbers under his catafalque, fluttering round the cupolas of their mosque, and beneath the gray-pink-and-white arcade, with its dull-green and plum-colored columns, or crowding together upon the thin branches of their plane-tree. A pure wind blew through the court and about the marble fountain. The music made by the irides­cent wings of the birds never ceased, and their perpetual cooing was like the sweet voice of content. The sunshine streamed over the pavement and penetrated under the arches, making the coral beads of a rosary glow and its gold beads glitter, giv­ing to the amber liquid carried on a tray by a 'boy to a barber beneath his awning a vivacity almost of flame. Beside me a lover was dictating a letter to a scribe, who squatted before his table, on which were arranged a bright-blue inkstand and cup, a pile of white paper, and a stand with red pens and blue pencils. Farther on, men were being shaved, and were drinking coffee as they lounged upon bright-yellow sofas. Near me a very old Turk, with fanatical, half-shut eyes, was sitting on the ground and gazing at the pink feet of the pigeons as they tripped over the pavement, upon which a pilgrim to the mosque had just flung some grain. As he gazed, he mechanically fingered his rosary, swiftly shifting the beads on and on, beads after beads, always two at a time. Some incense smoldered in a three-legged brazier, giving out its peculiar, and drowsy smell. On the other side .of the court a fruit-seller slept by a pile of yel­low melons. The grain thrown by the pilgrim was all eaten now, and for a mo­ment the sunshine was dimmed by the cloud of rising and dispersing birds, gray and green, with soft gleams like jewels entangled in their plumage. Some flew far to the tall white-and-gray minaret of their mosque; others settled on the cupola above the fountain. A few, venturous truants, disappeared in the direction of the seraskierat wall, not far off. The greater number returned to their plane-tree on the right of the lover and the scribe. And as the lover suggested, and the scribe wrote from right to left, the pigeons puffed out their breasts and cooed, calling other pilgrims to remember that even the sacred have their carnal appetites, and to honor the poor widow's memory before going up to the mosque to pray. One day I went up the hill toward Yil­diz to see the Selamlik. That morning the sultan was going to pray in the mosque of wood which Abdul Hamid built close to the mysterious, walled-in quarter of palaces, harems, kiosks, gar­dens, barracks, and parks which he made his prison. From the Bosporus you can see it extending from the hilltop almost to the sea, a great property, outside the city, yet dominating it, with dense groves of trees in which wild animals were kept, with open spaces, with solitary buildings and lines of roofs, and the cupola of the mosque of the soldiers. All about it are the high walls which a coward raised up to protect him and his fear. The mosque is below the great entrance-gates on a steep hillside beyond the walls. A large modern house, white, with green shutters, in which Abdul Hamid used to grant audiences and, I believe, to give ban­quets, looks down on it. From the upper windows of this dwelling the Turks say the ex-sultan often stared at his city through powerful glasses. The mosque is not large. It is yellow and white, with a minaret of plaster on the side next the sea, and a graveled court­yard surrounded by green iron railings and planted with a few trees. On the side next to Yildiz is a steep bank. A road runs up the hill to the left of the mosque as you face Yildiz, and another hidden road descends from the gates and gives access to the courtyard behind the mosque. The sultan has therefore a choice of two routes, and nobody seems to know beforehand which way he will come. There were very few tourists in Constantinople when I was there. Peo­ple were afraid of war, and before I left the Orient express had ceased to run. But I found awaiting the padishah many In­dian pilgrims, a large troop of pilgrims from Trebizond who were on their way to Mecca, several Persians wearing black toques, and a good many Turks. These were in the courtyard close to the mosque, where I was allowed to stand by the aris­tocratic young chief of police, who wore a woolly, gray, fez-shaped cap. Outside the railings stood a dense crowd of veiled women. Soon after I arrived a squadron of the body-guard rode up from the city, carrying red and green pennons on long staffs, and halted before the gates of the palace. And almost at the same moment the palace musicians, in dark-blue, red, and gold, wearing short swords, and carrying shin­ing brass instruments, marched into the enclosure. They stood still, then dropped their instruments on the ground, moved away, and sat down on the bank, lolling in easy attitudes. Time slipped by, and important people strolled in, officers, court officials, attendants. Eunuchs sham­bled loosely past in wonderfully fitting, long frock-coats, wearing turquoise rings on their large weak hands, and looking half-piteously impudent. Men hurried into the mosque carrying brown Gladstone bags. Nazim Pasha, weary and grave, the weight of war already on his shoulders, talked with the master of the ceremonies beside steps before which lay a bright-yel­low carpet. This is the sultan's entrance to the mosque. It is not imposing. The two flights of steps curve on right and left to a trivial glass porch which reminded me of that bulbous addition to certain pre­tentious houses which is dignified by the name "winter garden." Some smart, very strong Turkish sailors lined up oppo­site me. Not far from the porch stood a group of military doctors in somber uni­forms. A second yellow carpet was unrolled to cover the flight of steps on the left of the porch, more eunuchs went by, more Gladstone bags were carried past me. Then came soldiers in yellowish brown, and palace officials in white and blue, with red collars. Two riding-horses were led by two grooms toward the back of the mosque. The musicians rose lan­guidly from the bank, took up their instruments, turned round, and faced toward Yildiz. Through the crowd, like a wind, went that curious stir which always pre­cedes an important event for which many people are waiting. Nazim Pasha spoke to the chief of police, slowly moving his white-gloved hands, and then from the hilltop came a rhythmical, booming noise of men's voices, very deep, very male: the soldiers before the gates were acclaiming their sovereign. I saw a fluttering move­ment of pennons; the sultan had emerged from the palace and was descending by the hidden road to perform his devotions. In perhaps five minutes an outrider ap­peared from behind the mosque, advanc­ing slowly parallel with the bank, fol­lowed by a magnificent victoria, covered with gold and lined, I think, with satin, drawn by two enormous brown horses the harness of which was plated with gold. They were driven from the box by a gor­geous coachman, who was standing. The musicians, turning once more, struck up the "Sultan's Hymn," the soldiers pre­sented arms; the brown horses wheeled slowly round, and I saw within a few paces of me, sitting alone in the victoria in a curious, spread-out attitude, a bulky and weary old man in a blue uniform, wearing white kid gloves and the fez. He was staring straight before him, and on his unusually large fair face there was no more expression than there is on a white envelope. Women twittered. Men sa­luted. The victoria stopped beside the bright-yellow carpet. After a moment's pause, as if emerging from a sort of trance, the Calif of Islam got up and stepped slowly and heavily out, raising one hand to his fez. Then, as if with an abrupt effort to show alertness, he walked almost quickly up the steps to the glass porch, turned just before entering it, stood for an instant looking absolutely blank, again saluted, swung round awk­wardly, and disappeared. Almost imme­diately afterward one of his sons, a rather short and fair young man with a flushed face, attended by an officer, hurried past me and into the mosque by another en­trance. A few persons went away while his Majesty was praying; but all the pilgrims stayed, and I stayed with them. Several of the officials walked about on the gravel, talked, smoked, and drank orangeade, which a servant brought to them on a sil­ver tray. Now and then from within the mosque came to us the loud murmur of praying voices. The soldiers of the body­guard descended the hill from the gates of Yildiz on foot, leading their horses, and assembled outside the courtyard. They were followed by a brilliant squad­ron of cavalry in dark-blue-and-red uni­forms, with green-and-red saddle-cloths; their blood-red flag was borne before them, and their own music accompanied them. The soldiers in yellowish brown had piled arms and were standing at ease, smoking and talking. Twenty minutes perhaps went by, then a Gladstone bag was carried out of the mosque. We all gazed at it with reverence. What was in it? Or, if there was nothing, what had been recently taken out of it? I never shall know. As the bag vanished, a loud sound of singing came from within, and a troop of palace guards in vivid-red uniforms, with white-and-red toques trimmed with black astrakhan, marched into the court led by an officer. Some gendarmes followed them. Then the chief of police tripped forward with nervous agility, and made us all cross over and stand pith our backs to the bank in a long line. An out rider, dressed in green and gold, and holding a big whip, rode in on a huge strawberry-roan horse. Behind him came a green and red brougham with satin cushions, drawn by a pair of straw­berry roans. A smart coachman and foot­man sat on the box, and on each side rode two officers on white horses. Now the singing ceased in the mosque. People began to come out. The sultan's son, less flushed, passed by on foot, an­swering swiftly the salutes of the people. The brougham was drawn up before the bright-yellow carpet. Nazim Pasha once more stood there talking with several of­ficials. The soldiers had picked up their arms, the sailors were standing at at­tention. Then there was a very long wait. "The sultan is taking coffee." "The sultan is awake and is changing his clothes." This sounded promising, and I decided to wait. It seemed to me that his Majesty was a very long time at his toilet; but at last we were rewarded. Abruptly from the glass porch he appeared in European dress, with very baggy trousers much too long in the leg and a voluminous black frock-coat. He stood for a moment holding the frock-coat with both hands, as if wishing to wrap himself up in it. Then, still grasping it, he walked quickly down the steps, his legs seeming almost to ripple beneath the weight of his body, and stepped heavily into the brougham, which swung upon its springs. The horses moved, the carriage passed close to me, and again I gazed at this mighty sover­eign, while the Eastern pilgrims salaamed to the ground. Mechanically he saluted. His large face was still unnaturally blank, and yet somehow it looked kind. And I felt that this old man was weary and sad, that his long years of imprisonment had robbed him of all vitality, of all power to enjoy; that he was unable to appreciate the pageant of life in which now, by the irony of fate, he was called to play the central part. All alone he sat in the bright-colored brougham, carrying a flac­cid hand to his fez and gazing blankly before him. The carriage passed out of the courtyard, but it did not go up the hill to the palace. "The sultan," said a voice, "is going out into the country to rest and to divert himself." To rest, perhaps; but to divert himself! After that day I often saw before me a large white envelope, and the most ex­pressive people in the world were salaam­ing before it. From The Century Magazine – July 1913.